Rosetta Collection in The Internet Archive All Rosetta media files and documents about the languages of the world now reside in a special collection at The Internet Archive. Information is organized by language, and identified by name as well as three-letter ISO code (an international standard identifier). 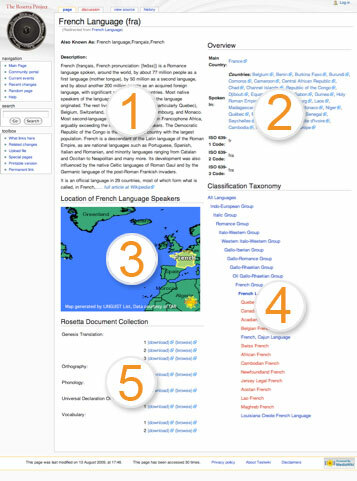 Rosetta Base in Freebase The Rosetta Base is a open public collection of data about languages of the world. It includes all of the languages in ISO 639-3 as well as language families and subgroups that denote descent from a common linguistic ancestor (we call these entities "Languoids"). The site currently represents a static data push from Freebase and the Rosetta Collection in the Internet archive. In the future, we expect to have sections of the page that are wiki-editable (like the language description), while other aspects of each page (like ISO code, classification taxonomy) would be data pushed from Freebase. The site is therefore more constrained in its structure, content and interface than a regular Wikipedia page. Fifty to ninety percent of the world's languages are predicted to disappear in the next century, many with little or no significant documentation.